Mr. Kirchoff was reported missing on August 12,2005 and was last seen by family members on the evening of August 11, 2005 in their home that he lived in as well. Mr. Kirchoff has been hospitalized in the past for mental illness and is known to be a user of alcohol. 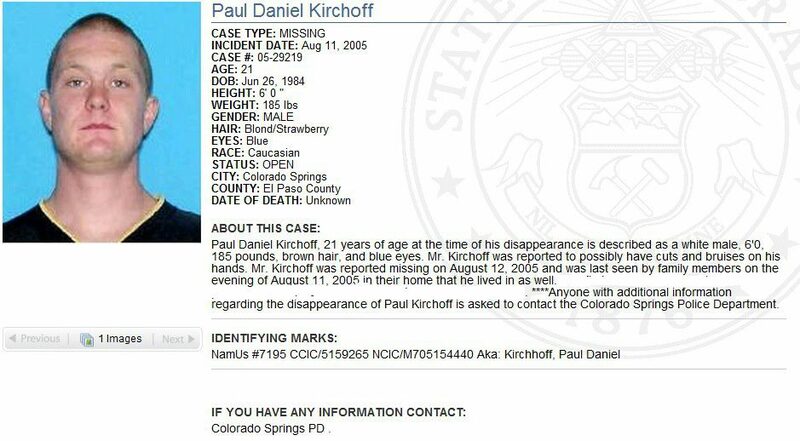 Paul Daniel Kirchoff has been missing since August 11, 2005 when he was last seen by his family in their home in Colorado Springs. Paul is 6’0″ tall, 185 pounds, brown hair and blue eyes.